Orb – of Orbit Earth Expo – got to reunite with his creator, Laurie Henry, last Thursday in Georgia. 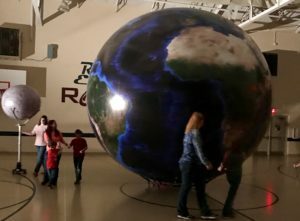 Orbit Earth Expo, our popular in-school astronomy field trip, was the brainchild of Laurie Henry in Texas, back in 2008. After years of lead teaching both Orbit Earth Expo and The Big Canyon Balloon geology programs, Laurie has moved back into the classroom (science, of course!) in Rock Spring, Georgia in Walker County Schools. If the sun is directly above my head, what time is it in Africa? 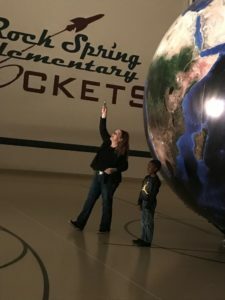 At Rock Spring Elementary, where Laurie declares herself the “ST” of STEM at her school (colleague Ralph Keith holds the title of the “EM”), Laurie was reconnected with her buddy Orb. We’re not sure who had more fun, Laurie or the kids, but a great day (and science night!) was had by all. 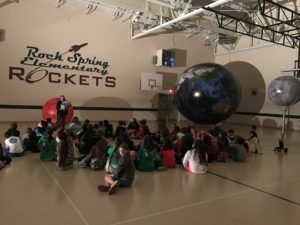 Rock Spring Elementary students got to experience day vs night – the program is taught in the dark with a light to represent the sun and students are awed as their classmates rotate the 14′ earth to watch dark and light, day and night fall before their eyes. When a student is “sitting on Africa”, what time of day is it? Lunch time, of course! But is it the same in Australia? What about the Pacific? 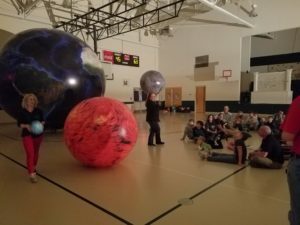 Students and teachers alike enjoyed the wonder of Orbit Earth Expo….and so did parents at the STEM Night that evening. Parents and kids together pondered the question “Does the moon rotate?” A demonstration with our models answers that question and explains the reasons behind it. Students explore many concepts in our programs, including day vs. night, rotation, revolution, eclipses, tides, seasons, winds, phases of the moon, and more. The students at Rock Spring Elementary were fantastic listeners, learners, and contributors to a great day of interactive teaching! Seasons – Why does the tilt of the earth matter? Rotation – How long does it take the earth to rotate? Parents act out the earth, moon, and sun!